Thank you for your concern about clean and safe drinking water in DC Public Schools. Last school year the Department of General Services (DGS) completed a comprehensive test of all drinking water sources in DC Public Schools (DCPS) ensuring that they remained free from lead and safe for drinking. During this testing, if a source was found to have an elevated level of lead, it was taken out of operation and DGS worked to fix the issue by installing a filter or replacing equipment. DCPS families were advised of the testing as well any associated repairs and retesting. These results remain available for review at www.dgs.dc.gov/page/water-sampling-results-dc-public-schools. In July, the Council of the District of Columbia introduced legislation on water testing in schools and child-serving facilities that would prescribe the frequency and volume of lead testing. This legislation is currently under Council review. For the 2016-2017 school year, filters have been placed on all drinking water sources within DCPS Schools. This includes water fountains, all sinks in health suites, and sinks in kitchens. Sinks in bathrooms and classrooms are not designated as drinking water sources and have been labeled accordingly to prevent consumption. This year, the Department of General Services will again complete lead testing in all DCPS School drinking water sources. Testing plans, results, and any actions taken will be shared with DCPS families. You can learn more about the dangers of lead exposure and the national standards for water testing in schools and child-serving facilities at www.epa.gov/dwreginfo/lead-drinking-water-schools-and-child-care-facilities. You can also learn about lead testing options for your home at www.dcwater.com/lead/LetterToCustomers.cfm. If you have concerns about your child’s health and/or exposure to lead, please contact your pediatrician immediately. 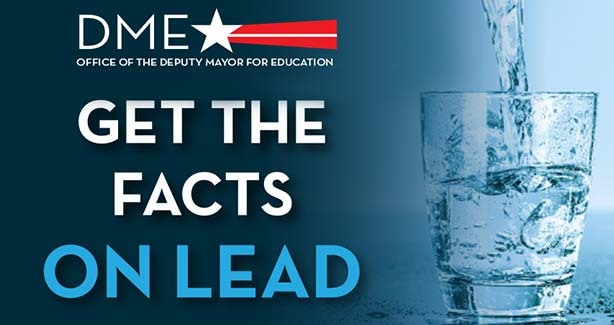 For questions about lead testing in District schools, please call 202-442-5559 or email [email protected].